Inglenook has been kept in excellent condition throughout by the current owners and provides close to 2,000 square feet of bright and versatile living accommodation across two floors whilst enjoying a superb mature plot of approximately 0.17 acres. Should a potential purchaser wish to extend the property further, there is planning permission granted for a substantial extension to the rear and side of the property, plans are available to view on the Runnymede Borough Councils website (Planning Ref RU.18/0529). Disclaimer - Property reference 2472422. The information displayed about this property comprises a property advertisement. Rightmove.co.uk makes no warranty as to the accuracy or completeness of the advertisement or any linked or associated information, and Rightmove has no control over the content. This property advertisement does not constitute property particulars. 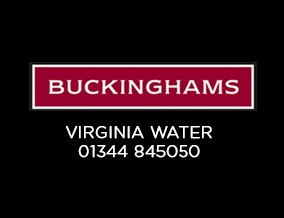 The information is provided and maintained by Buckinghams, Virginia Water . Please contact the selling agent or developer directly to obtain any information which may be available under the terms of The Energy Performance of Buildings (Certificates and Inspections) (England and Wales) Regulations 2007 or the Home Report if in relation to a residential property in Scotland.